super sweet! Thanks for the inspiration as I've had that AE set and haven't inked it up! I really, REALLY hope this isn't a double comment. My stupid computer is testing my patience!! I'm not one for baby bottles and rattles either. I like the idea of a story book stamp set!! Besides, how can one go wrong with a story book?!! I have been on a hiatus from blogs lately. I just wanted to let you know I enjoyed visiting and catching up!! This is just darling. I am so glad that I bought this story book set, and thankful for your beautiful inspiration to ink it up already. Great touch to have the duck just a tad over the edge of the paper. I also like that you used bold colors--also non-traditional for a baby, and really works well. thanks. I love bold colors for baby gifts. What a sweet tag. I love the story-book theme rather than the rattles and bows! I especially like the name in that cute font. 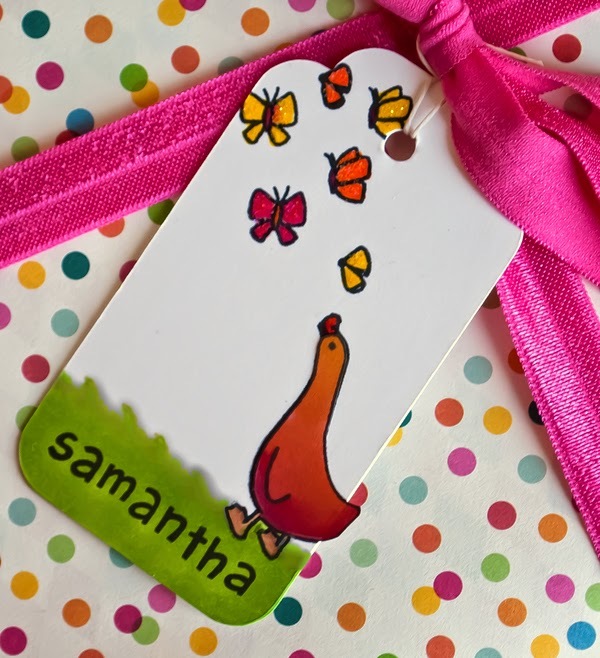 Very cute for a baby gift tag or card! The versatility is great, considering your preferences and working with limited supplies. Plus, it's just darn adorable! I think it is adorable! I do get tired of all the soft pastels for babies, they like bright colors too!